From Vizag we reached Shrikakulam by train and checked in at hotel Nagavali beside the Nagavali River. On the first day, we visited Shalihundam and Kalingapattanam from Shrikakulam, and Arsavali Sun Temple and Kurmaswami Temple in Shrikakulam. On the second day, we hired an auto for Rs. 1300/- (negotiable) to take us to Srimukhalingam - Lord Shiva Temple at Mukhalingam village, 53 km from Shrikakulam. 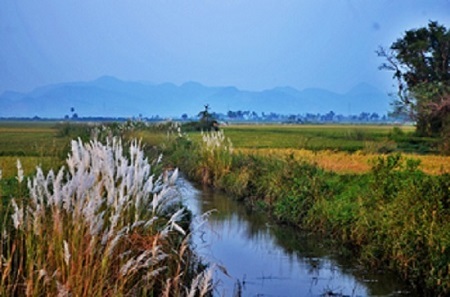 The village is located in Jalumuru Mandal, Srikakulam district of Andhra Pradesh, on the banks of River Vamsadhara, and was the capital of Kalinga Ganga Kings for over 600 years. Srimukhalingam is popularly known as Dakshina Kashi (Varanashi of South India). In such travels, that offers combo of nature, countryside, art, architecture and religion, our preferred mode of transport is Auto which gives safari-like experience being open on three sides, air spraying cool bath, and opportunity of photography on the move. It is indeed the best way to enjoy Andhra Pradesh countryside, lush green, farmlands on either side, background hills occasionally keeping watch and smiling, shepherds on job with customary hat, and the chance to stop at every place of liking for a brief photo session. 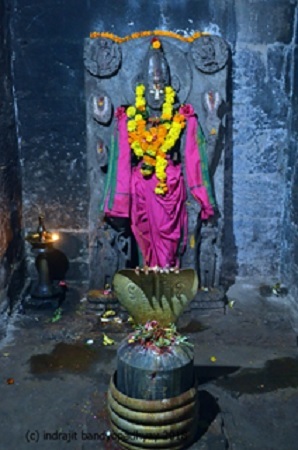 Srimukhalingam temple dedicated to Lord Shiva, known as Sri Mukha Lingeswara Swamy, actually houses 3 Ancient Temples in close vicinity - Madhukeswara, Someswara and Bheemeswara Temples. 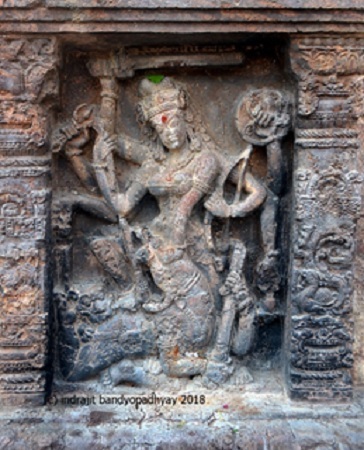 The temples bear testimony to the magnificent architectural tastes of Kalinga Kings of the Eastern Ganga dynasty or later known as Chodaganga dynasty after Anantavarman Chodaganga (c. 1077–1147). 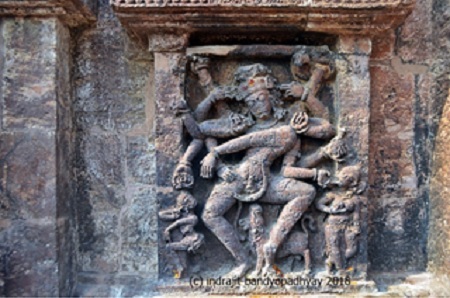 Chodaganga’s Korni Copper Plant Grant (1112 AD) mentions that Madhukeswara temple was built by his ancestor Kamarnava. This dynasty flourished mostly during the period 11th century to the early 15th century, but had beginning before with Indravarman (496 – 535). There is difference in opinion regarding the period of rule of different rulers of the dynasty. 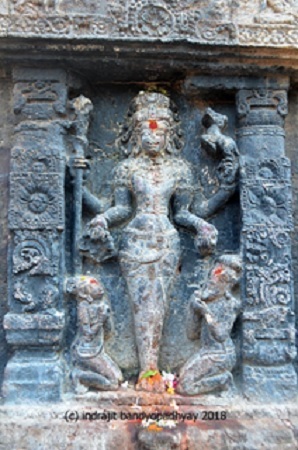 The Srimukhalingeswara Madhukeswara temple was built by Kamarnava–II in 8th century AD [i]. Two other opinions place Kamarnava–II at 803-853 AD, or 1015 AD. Alternative opinion is: the construction began during rule of Kamarnava I (941-976 CE). 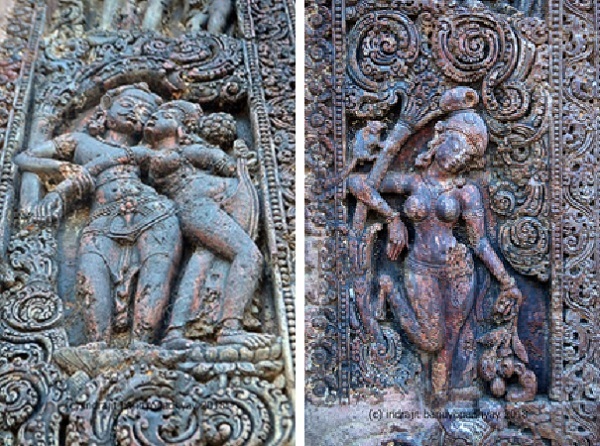 But 8th century AD is the most accepted date because of new found inscriptions and resemblance of sculptures with early Chalukyan sculptures of 8th century AD. 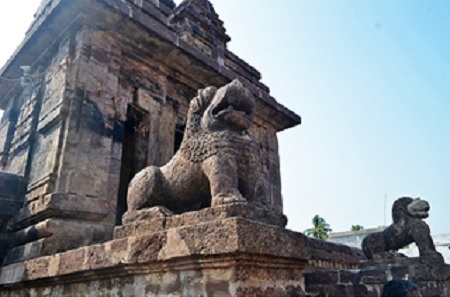 According to Lionel D. Barnett, Kamarnava–II was grandson of Virasingha (the founder of eastern Ganga dynasty) and son of Danarnava, Virasingha’s second son. 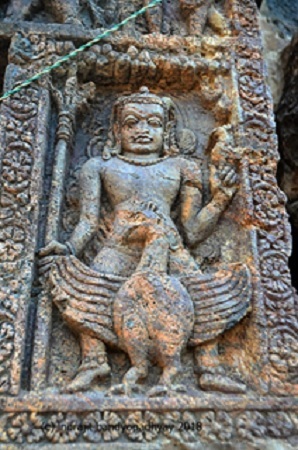 Virasingha’s five sons ruled from different places, while Danarnava and Kamarnava–II retained the centre at Kalinganagara which has been identified with Mukhalingam. 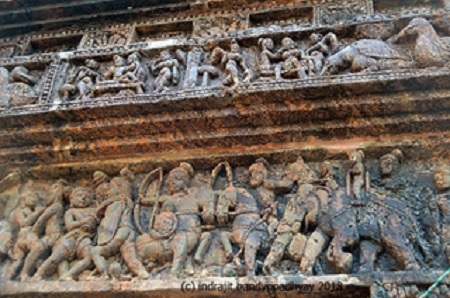 The early rulers of the dynasty ruled from Dantapura; the capital was thus moved to Mukhalingam, and even later by later rulers to Kataka (modern Cuttack). 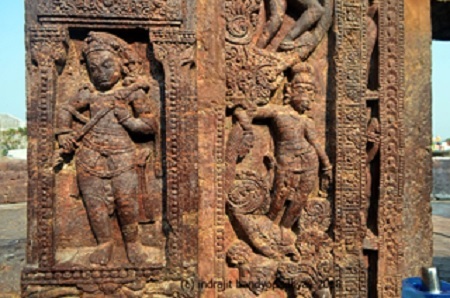 At their zenith, the eastern Ganga dynasty had sway over the whole of the modern-day Indian state of Odisha as well as parts of West Bengal, Andhra Pradesh and Chhattisgarh. 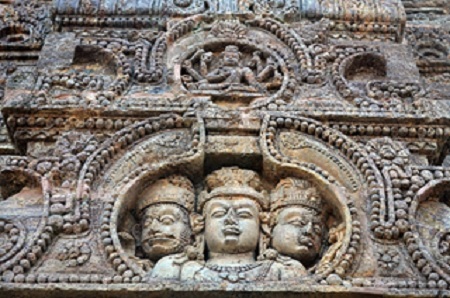 Today, they are most remembered as the builders of the Konark Sun Temple, Odisha. 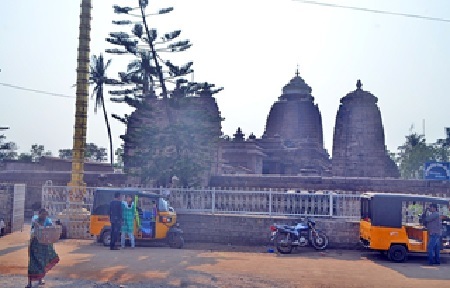 But Srimukhalingam temples are the Less Known "Hidden Treasures" Of India (from tourist perspective, of course, because local pilgrims abound from Andhra and Orissa). 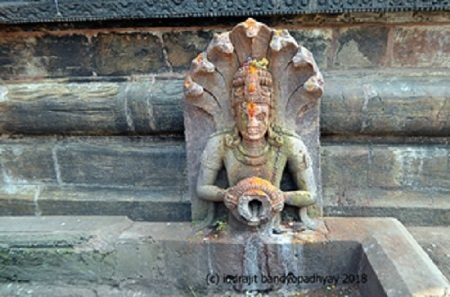 The uniqueness of Sri Mukhalingam is that, in the main temple, the Shiva Lingam has the face (Sri Mukham) of the Lord. Secondly, the Lingam is not of stone formation but is a Fossil of the trunk of Ippa (Madhuca) tree with a naturally carved face. Unfortunately, photography is not allowed inside the Sanctum Sanctorum; so, I could not take shot. Madhuka trees are plenty in this region. According to the Sthala Puranam, Lord Shiva manifested here in a Madhuka Tree. 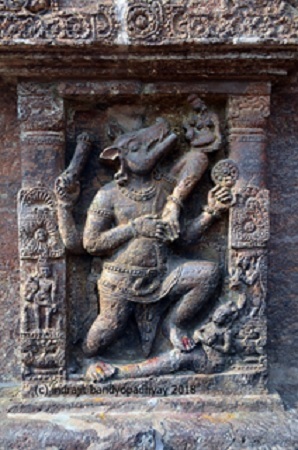 His purpose was to relieve the Gandharvas born here as Tribals (Sabaras) by Vamadeva Maharshi’s curse. 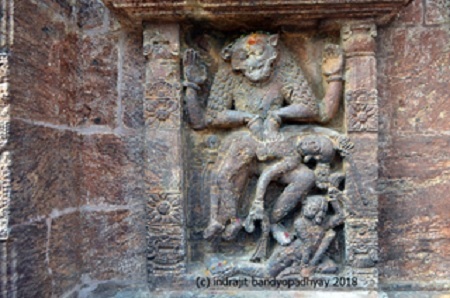 Thus Shiva here is also hailed as Sri Madhukeswara Swamy. 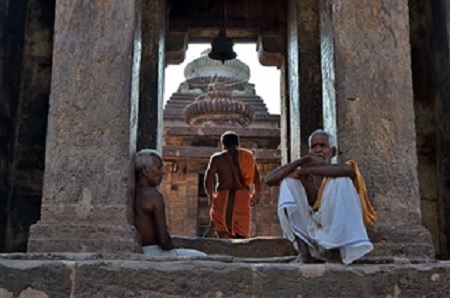 The temples are great attraction for the religious minded and pilgrims. But they are great places for lovers of art, architecture and heritage. 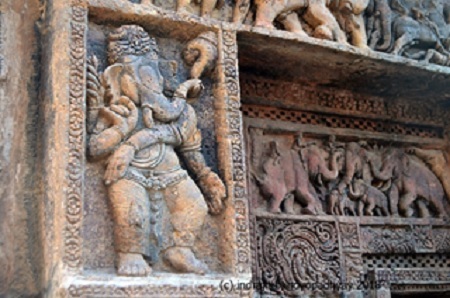 What would attract the latter are marvelous Stone works – the sculptures, reliefs and bas-reliefs adorning the temple walls. The East-facing Madhukeshvara temple rises to a height of about 65 feet. It took us one hour and half to reach the temple. Our auto parked on the opposite side of the road in front of the temple. 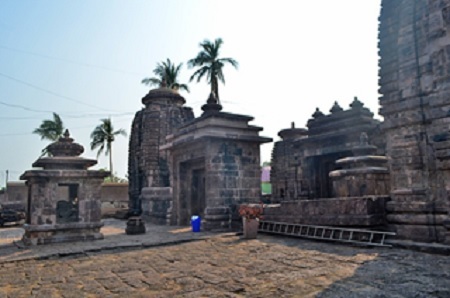 The temple is surrounded by a high prakara wall with the main gate on the East and another on the south. The temple is a panchayatana type. 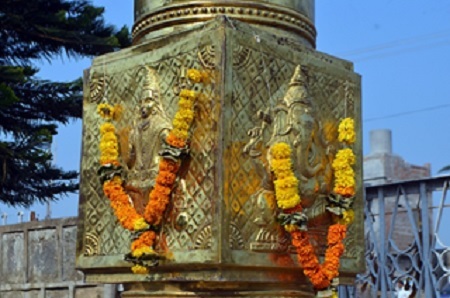 As one enters the premise from the East, a tall golden Dhwajastambha welcomes with depictions of Shiva and Ganesha. A small space, and then one has to ascend few steps to the main arched gate with two lions on both sides of the gates. 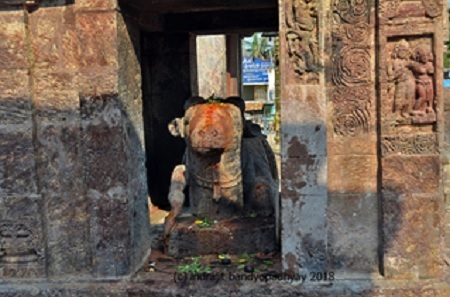 Crossing the gate is the outer prakara where the idol of the Nandi is installed in a mandapam with beautiful bas-reliefs. The temple has four subsidiary shrines at the corners, and enshrined here are the lingas dedicated to Indresvara, Agneswara and Yamesvara. Two more subsidiary shrines on the northern and western wall enshrine the Saptamatrika and Kumarasvamy respectively. Behind the main deity is a Golem (huge mud pot) bigger than the sanctorum door. This has an interesting “once upon a time” story. Once upon a time there was a potterman named 'Naganna'. He was devoted to Shiva and would offer puja every day asking children. One day, he decided to offer the Golem of milk to Shiva but because of its bigger size and weight, he could not take it to Shiva. He had to leave it and left sadly for home. Next day morning, when the priest opened the temple, to his utmost astonishment, he found the Golem just behind the deity. Everyone believed that it was the magical deed of the god. The potterman was blessed with a child. 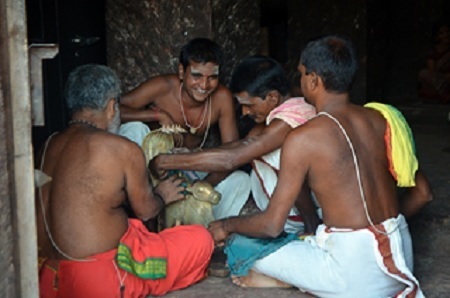 Every year, lakhs of pilgrims visit from Odisha and Andhra Pradesh to take Chakratirtha snanam (holy bath). On the auspicious day of Shivaratri, about two lakh devotees visit the temple and offer Puja after a holy dip in the Vamsadhara River. 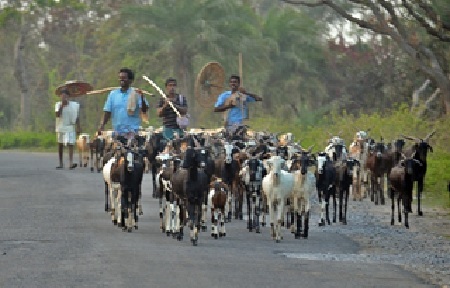 Cultural events and dramas are also held over a period of two days. 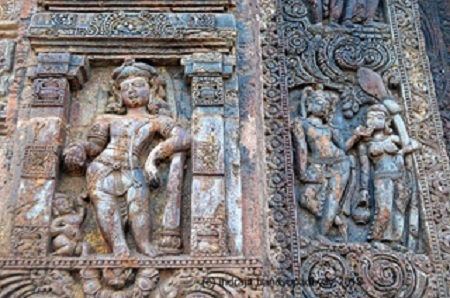 Constructed in the Indo-Aryan style, specifically Orissa style of architecture, the shrine is a gem of art and sculptures. The whole temple including the subsidiaries is a celebration to the eyes and spirit with stunning and amazingly elegant sculptures. 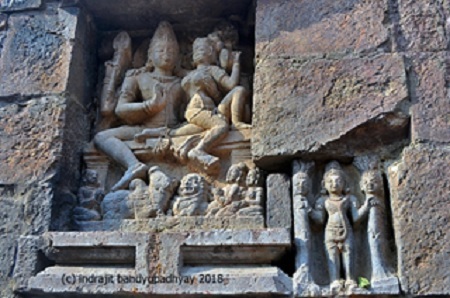 It takes time to closely inspect the sculptures on the wall and to understand their significance. So, I would advise art lovers to have at least three hours for the main temple. In the next part, I would continue with the Someshwara and Bhimeshwara temples.